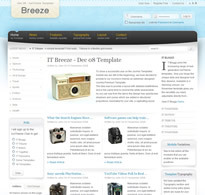 Breeze is the latest theme from provider IceTheme and it's now available for members to download. It comes with four styles, a plethora of module positions and it looks really quite nice; maybe because of the grid based design concept used when putting it together. I didn't know either, but apparently grid based design brings visual structure and balance to site design and IceTheme even go about explaining it on their site. Anyway, it does look nice. The content is structured and if you want anymore information, you can click here for a demo or more information.